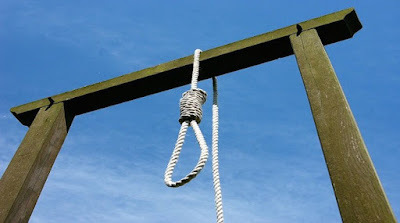 An Ado-Ekiti High Court on Monday found Michael Adams and Abass Mutiu guilty of armed robbery and murder and sentenced them to death by hanging. The Chief Judge, Ayodeji Daramola, convicted them for committing armed robbery contrary to Section (1) 2 (a) of the Robbery and Firearms (Special Provision) Act Cap R11, Laws of the Federation of Nigeria 2014. He also found them guilty of murder contrary to Section 316 (1) punishable under Section 319 of the Criminal Code Laws of Ekiti State, 2015. According to the charge, Messrs. Adams and Mutiu committed the offences on 22nd January, 2014 at Fiyinfolu Avenue, off Ilawe Road, Ado-Ekiti when they robbed one Arowosere Kabiru of N12,800 while armed with dangerous weapons like guns and cutlasses. It also came before the court that the two convicts in the course of their robbery operation murdered one Ojo Adebola. They were arraigned in court for the first time on March 1, 2016 when the charges were read to them to which they pleaded not guilty. A legal officer from the office of the Director of Public Prosecution (DPP), D. Oyewole, called four witnesses to prove the case. Exhibits tendered were the statement of the accused, Indian hemp, two motorcycles, cutlasses, cartridges, photographs of the deceased and photographs of the parade of the convicts by the police. The accused were led in evidence by the State Director of Legal Aid Council, Olaitan Adeloye. One of the witnesses who was among the victims of the attack identified the accused persons at the identification parade conducted by the state police command. The judge subsequently imposed death penalty on them for the killing of Mr. Adebola ordering that they be hanged on the neck until life goes out of them.